Donald Trump has said he is working on a "major trade deal" with the UK. The US President tweeted that a bilateral trade agreement with the UK after it leaves the EU in 2019 could be "very big and exciting" for jobs. Mr Trump, who backed Brexit, also took a swipe at the EU accusing it of a "very protectionist" stance to the US. 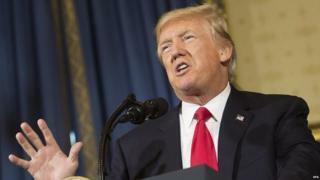 The US President, whose officials are meeting British counterparts this week, has been accused of protectionist rhetoric by his political opponents. The UK's International Trade Secretary Liam Fox is currently in Washington discussing the potential for a UK-US trade deal after the UK's withdrawal from the EU in March 2019. No deal can be signed until after then. Mr Trump has said he would like to see a speedy deal although free trade agreements typically take many years to conclude and any agreement, which will have to be approved by Congress, is likely to involve hard negotiations over tariff and non tariff barriers in areas such as agriculture and automotive. On Monday, Mr Fox published details of commercial ties between the UK and every congressional district in the US as a working party of officials met to discuss a future trade deal for the first time. Two-way trade between the two countries already totals £150bn. Mr Fox is also discussing other issues, including the continuation of existing trade and investment accords, with trade secretary Wilbur Ross and the US Trade Representative, Robert Lighthizer. At a breakfast meeting for members of the House of Representatives, Mr Fox said his twin objectives were to provide certainty for foreign investors ahead of Brexit and to expand the volume and value of trade with the US. "The EU itself estimates that 90% of global growth in the next decade will come from outside Europe, and I believe as the head of an international economic department that this is an exciting opportunity for the UK to work even more closely with our largest single trading partner the US," he said. Sir Vince Cable, the new leader of the UK parliament's fourth largest party, the Liberal Democrats, said a US-UK trade deal could bring significant benefits - but he called on the government to guarantee parliament would get a vote on it first. "Liam Fox and Boris Johnson must not be able to stitch up trade deals abroad and impose them on the country," he said. "It is parliament, not Liam Fox, that should be the final arbiter on whether to sacrifice our standards to strike a deal with Trump."